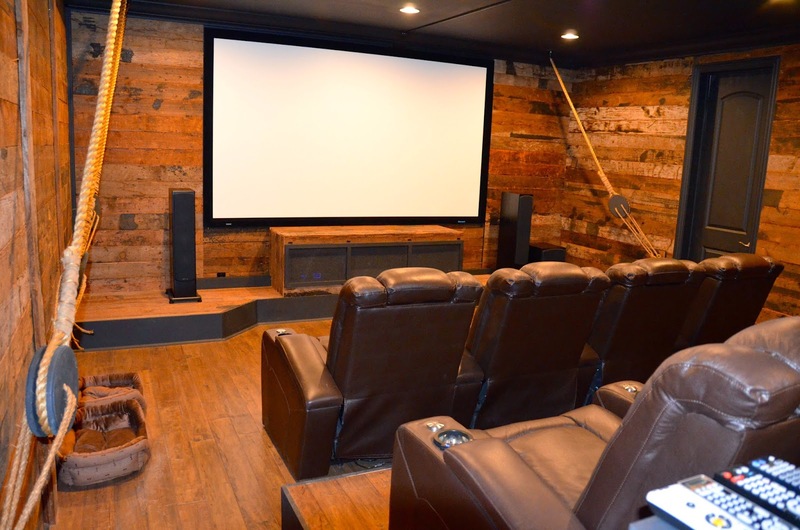 Anyone planning to create their own home theater is faced with a multitude of options, which can at times be daunting. First, what theme do you want your home theater to have? What kind of décor will it take to bring that vision to life? And what are the nuts-and-bolts essentials—TV, audio electronics, lighting, panels, theater seats—that will be needed to best integrate with the overall design of the theater? Do you create the design first and then add in the specifics, or do you create your design around the specific things you want first? 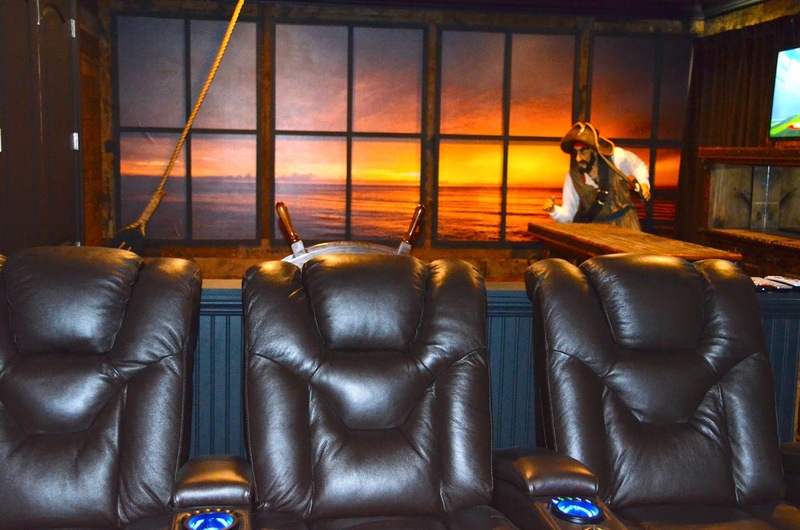 One of 4seating’s customers decided to share with us the pirate-themed home theater he crafted around the Seatcraft Element, a luxury model in its Signature line of home theater seats. The results, as seen in the video presentation he created, are truly dazzling: a model of home theater construction from initial vision to finishing touches, which illustrates how effectively a good theater seat choice can be integrated into a well-planned design. 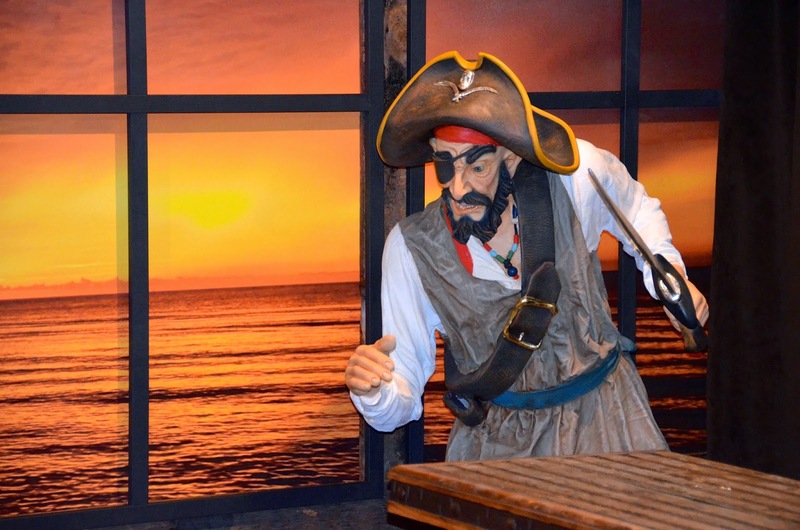 First, came the theme: a fearless Pirates Of The Caribbean motif replete with ocean murals, authentic reclaimed wood siding, pirate statues, and an honest-to-goodness spinning steering wheel for the kids! Careful blueprints, including a 3D digital outlay (very similar to the 3D render service offered at 4seating, in which you give us your room measurements and we create a complete mockup of your design!) were first created, and then each layer carefully added in one-by-one. The mural was put up, the windows were covered with retractable wood siding, a flat screen TV was installed, an electronics cabinet was built, and then the seating finally made its appearance. For seating, two rows of Seatcraft Element chairs from 4seating were chosen. The Element is a relatively recent addition to the Seatcraft Signature line, offering a wide array of features. The seat is constructed from Leather 7000, a top grade of leather that is chosen from the top third of all hides and then buffed to perfection. The unique, shiny black onyx shade projects just the right kind of bold power needed for a pirate ship, but this seat isn’t stuck in the past by any means--power adjustable headrests allow one to find just the right position for the head and shoulders, at the touch of a button. Power recline also extends through a chaiselounger footrest that provides full lower body support, making the Element the envy of the high seas. Lighted cup holders and ambient base lighting emit a soft azure glow that provides a helpful accent in a darkened theater, but as one can see from the video, none of these hi-tech features detract from the way in which the chair expertly blends in with the sunset ocean mural and antique wooden panel effect. 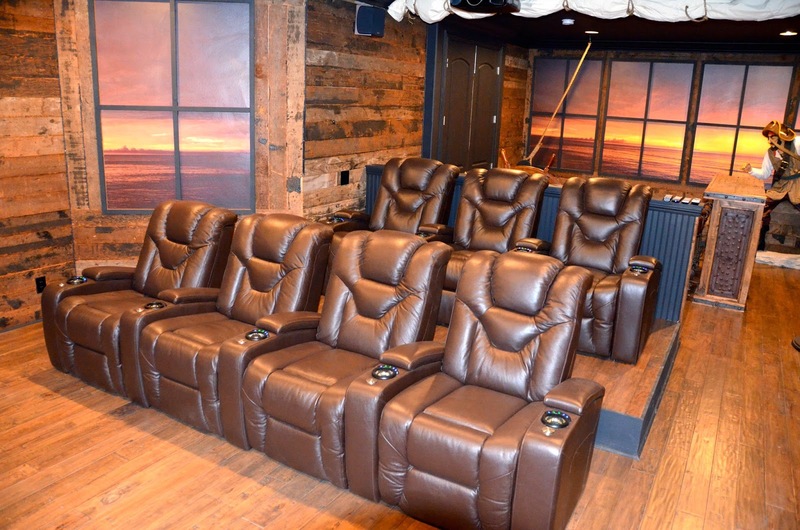 4seating is pleased to have been a part of the success of this amazing home theater project, which dazzles the eye from its state-of-the-art seating to the many authentic pirate touches found throughout, including rope accents and even a rigged sail. Apparently a few finishing touches are still planned, but when it’s all complete we wouldn’t be surprised if one of the Pirates Of The Caribbean movies is on the opening night’s marquee! Congratulations to Adam and Alicia for a job well, well done. Do you like what you see? Give us your home theater ideas, and we here at 4seating can help you realize them with just the right theater seat to fit your required look, features, and budget. A link to Adam’s video, detailing the step-by-step construction of his piece de resistance, can be found here. A link to the 4seating page on The Element, which includes a product video, can be found here.